Digital marketing trends for 2017| Digital agency | DVO. Digital marketing trends for 2017. This week we’re looking at emerging digital marketing trends for 2017 and how they will impact your brand. Happy new year to everyone. 2016 was a good, if sometimes challenging, first year for DVO. The London based full-service digital agency landscape is a competitive one! So for our first post of the year I wanted to talk about emerging digital marketing trends for 2017. Wholly inspired by Gartner’s 5 key emerging digital marketing trends. Where has the purchase funnel gone? Suffice to say 2017 will be another year of flux as marketers evaluate new technology and marketing approaches, integrating where they can to take advantage. What’s still apparent to DVO is that the customer is 2, sometimes 3 or 4, steps ahead of most. Many brands are still playing catch-up with real pressure from sector disruptors and a consumer empowered like never before to deal with. The old-style discrete, linear purchase funnel simply doesn’t exist anymore. Customers move at their own pace. Interacting when, where and how they want to across multiple channels. “83% of consumers are more likely to do business with brands that allow them to control where, when and how they interact.” CFI Group. What does it mean for my brand? This puts more emphasis on understanding the customer, their journey and potential interaction points. This is where the power of big data comes into play, using it intelligently to understand where a customer is but more importantly using it to move the customer to the next stage. It also means key emphasis should be placed on customers as individuals as each journey can be very different, a macro view of the customer serves little purpose on this basis. Customers as individuals will be a key-theme for 2017. The balance of power has shifted to the customer; smart brands understand this and are actively looking at ways to nurture their best customers. Using those customers to tell the brands story. 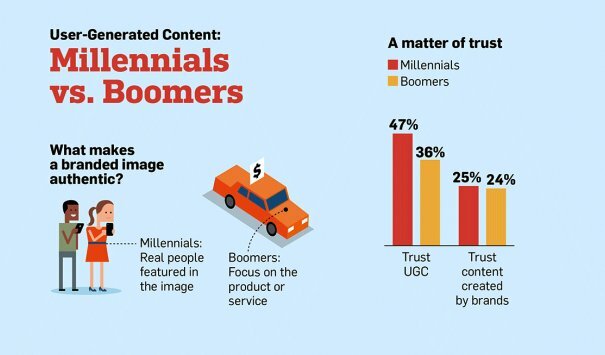 Customers are twice as likely to trust content created by other customers as opposed to brands. Graphic curtesy of Adweek, It doesn’t mean stop doing content marketing at all. What it does mean though is that brands should be looking at how they can create a framework to encourage those stories, curating them if you will. The right framework will allow you to capture the content and then extend the reach of the story. Focus on how you identify and nurture your best customers, giving them a platform to tell your story to a wider network than they would otherwise have done on their own. This is a key mind-set change from creator to curator. For an in-depth look at UGC strategy take a moment to download our latest white paper, here. No trends blog would be complete without a mention of big data. It’s big and it’s data! However it’s important especially as the purchase funnel has become far more complicated. Focusing efforts on capturing data across the customer journey and analysing it to understand and then implement activity at the right point in the right way is a sure win. You’ve probably got data coming in from all sorts of places, the emphasis here is on combining it and then using it to better understand the customer journey. As marketers our job is simple, to put the right message in the right place to move the customer towards purchase, simple. Not so simple when you’ve got loads of channels and a customer who doesn’t play by the rules anymore. In the short term using personas to map out the stages a customer moves through gives you a grounding to start to think about what you do next. For an in-depth look at UGC strategy take a moment to download our latest white paper, here. This has been on everyone’s agenda for a while and it’s a key digital marketing trends for 2017. This is a direct result of the discrete linear funnel no-longer existing. The customers’ perception of you and ultimately their decision to purchase is based on the sum of their interactions with your brand. Understanding this is vitally important. Once you have a start on the customer journey you can think about how each action you take at a specific point knits together. This means you need to be thinking integrated. 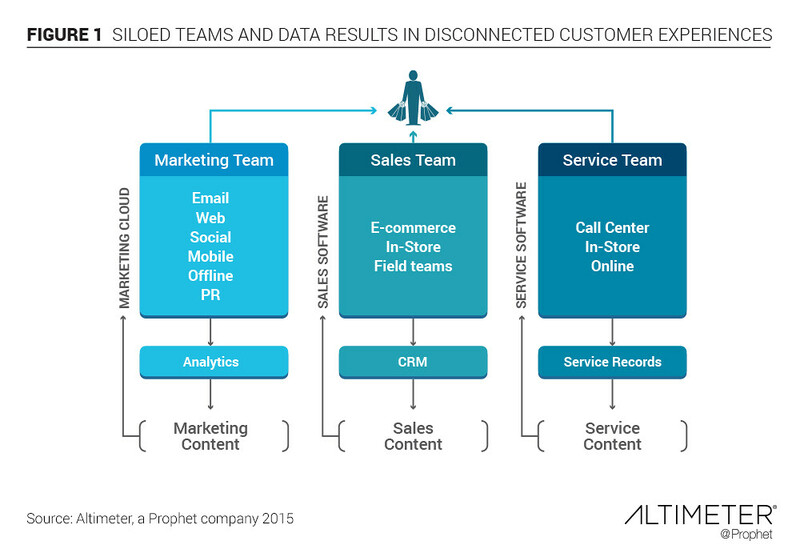 Siloed structures work against a uniform customer experience. Even if you’re still very siloed, get everyone in a room once a month and get them talking about their specific activity. It will be very apparent, if you understand your customer journey, what fits and what doesn’t. This is a bigger shift than perhaps you want to make, so start small. You can test content centric campaigns with earned distribution simply and cheaply, if nothing else it gets teams working together. We wrote a post recently talking about integrated marketing with tips, theory and a case study that gives you a strong insight into the bits that matter. Read it, here. So that’s our digital marketing trends for 2017, it’s a lot to deal with. That’s why we’ve thought long and hard to create simple road maps for our clients to get them on a path to realigning their marketing around the customer. If you want the gap between your brand and customer to stop widening then contact us here, or give us a call, 0203 771 2641.